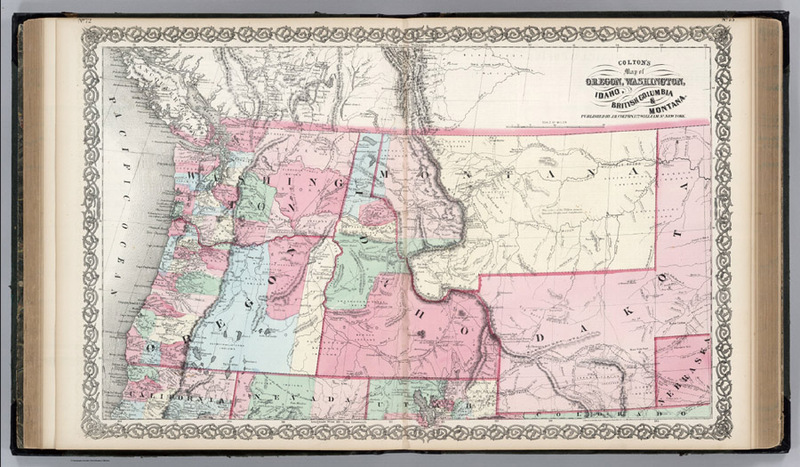 It became a territory 150 years ago today — but it took another 27 years to win admission to the Union as the 43rd state. And although it’s been amended many times — most recently in 2012, to guarantee the right to fish, hunt and trap14 — it is the only Constitution Idaho has ever had. • Limiting the right to vote to men,21 even though women had been allowed to vote for and be school officials in the Territory. The text of the original 1890 Constitution is online at Google Books, and today’s Constitution as amended is online at the office of the Idaho Secretary of State and at the website for the Idaho Legislature. 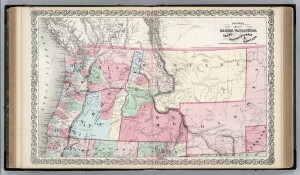 Image: Colton’s Map of Oregon, Washington, Idaho, British Columbia & Montana (New York: J. H. Colton, 1865); digital image, David Rumsey Historical Map Collection (http://www.davidrumsey.com/home : accessed 3 Mar 2013).